This pan is great for making pizza, pancakes, eggs and even giant cookies. It is also extremely easy to clean. The dual skewers cooking rack can really maximize your air fryers cooking surface. 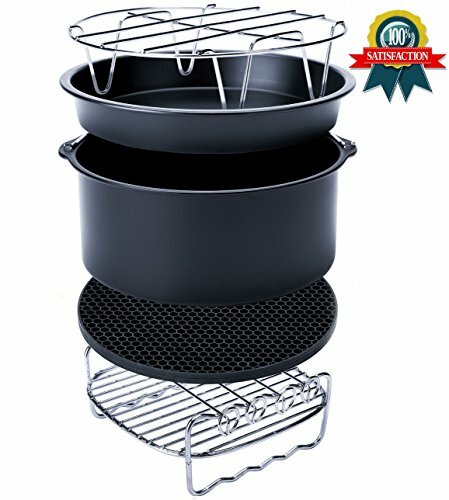 It provides more space, while also allowing you to air-fry more food in one go. 7 inch diameter, maximize your cooking space, and perfect for vegetable or meat kabobs. ❤❤❤Warning: Make sure to use a heat protected cloth when removing this from the air fryer.Have a delicious cooking. If you have any questions about this product by FourWinner, contact us by completing and submitting the form below. If you are looking for a specif part number, please include it with your message.